I really struggle to know what to have for lunch sometimes. Usually I am scrambling round in the cupboards trying to find some sort of suitable sandwich filling but I do get terribly bored of sandwiches. If I’m lucky I’ll have some keptovers to warm up and I do pay a visit to a local independent café from time to time too. Well enough is enough. I have decided to batch cook and freeze a range of healthy, filling, vegan soups; one of which is this Chipotle and Bean Soup. So that I can grab whichever soup I fancy and not have to think about what’s on the meal plan for dinner I am making them vegan, stuffed full of veg and flavour packed. I hate to have the same thing for lunch and dinner you see! Start by heating a little oil in a large saucepan and adding the onion and pepper. Fry on a medium heat for 10-15 minutes until softened. Add the spices and chipotle chilli and cook for two minutes more. Pour in the passata then refill the jar to half full with water, rinse the jar then add the water to the pan with the vegetable stock and beans. Simmer for 15 minutes then add the sweetcorn, bring back to a simmer and cook for five more minutes. Squeeze in the lime juice then add a little seasoning. Leave to cool and divide between freezable containers then leave to cool completely before freezing. 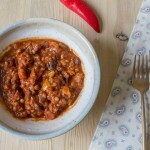 Currently I have two soups on the go in the freezer, this one and my Autumn Vegetable Minestrone. The problem is that I don’t have enough Tupperware left to make any more soup at the moment; I shall need to rectify that and get some more ASAP! 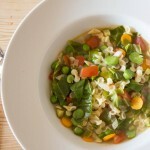 Another soup that I will be making a big batch of to add to the soup drawer is my Split Pea Dahl. I’m also planning some sort of chickpea harissa soup and maybe a nice pea, potato and mint too. Five in total, one for each day of the week. And yes, before you ask, I do label each of my soups up and stack them neatly in the freezer; the satisfaction and uniformity brings me much joy. Totally agree, c’ant have same lunch and dinner. Great idea to make lots of soup and this one looks delicious with just a nice kick. I, on the contrary, can have the same thing over and over if it’s delicious :-))) This bean soup looks filling and delicious..a perfect winter warmer too. 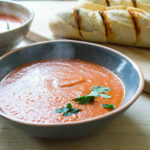 This is a great idea, I too bore easily of lunch-time sandwiches so batch cooking soup is a good idea for a quick and healthy meal. YUM! We are definitely trying this next week! My favorite thing about soups is having leftovers for the rest of the week. This is so perfect! Oh I can eat the same thing over and over it’s my husband that can’t eat the same thing for each meal. I definitely could eat this for breakfast, lunch and dinner. Your soup collection sounds very impressive, way to go! it’s amazing what a little lime juice will do for something like this! excellent hearty soup, caroline! This is perfect at this time of year, I love a good bean soup and yours certainly looks delicious! Love soup! And we have it all the time during the cool months. Had it last night for dinner, as a matter of fact. This looks like a good one — thanks! I eat a lot of the same stuff on repeat until I stop that pattern and then remember how fun it is to mix it up. I do love to batch cook…just knowing something tasty is ready for me in minutes is a great feeling. This soup would hit the spot.